FLIP: You can target 1 monster on the field; destroy that monster. If this face-up card in its owner’s control leaves the field because of an opponent’s card effect: You can Special Summon 2 “Krawler” monsters with different names from your Deck in face-down Defense Position, except “Krawler Spine”. You can only use each effect of “Krawler Spine” once per turn. Not Good Enough. Krawler Spine is a Level 2 Earth Insect-type Flip Monster with 300 Atk and 2100 Def. The Flip Effect is to destroy one targeted monster. Targeted destruction is not great, and Flip Effects are slow. The face-up effect needs your opponent to remove Krawler Spine from the field by an effect. You would get to Special Summon two Krawlers with different names from the deck face-down. The two effects don’t’ work well together, but having both is at least some fuel to the Krawler engine. The effects being a hard once per turn were hardly necessary, especially the Flip Effect. Nope, just not good enough even if it is necessary in its own deck. To end this week off, we will look at one of the Krawler monsters, which I think are based off the human spine, and this one isn’t subtle about it, Krawler Spine. Spine is a Flip monster that is basically Man-Eater Bug, man that card is old. 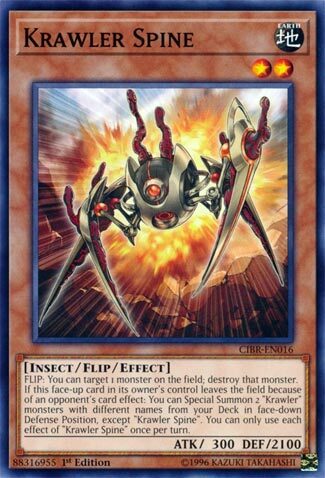 No one plays Man-Eater Bug like they did in the caveman Yu-Gi-Oh days, but this is staple in the Krawler deck since it has support around it unlike Man-Eater Bug. Spine has an effect all of the Main Deck Krawlers have, and that is if they leave the field because of an opponent’s card effect while face-up, you can summon two Krawlers with different names from the Deck in face-down Defense Position. Having this on a Flip monster is odd, as it is likely going to be face-down when destroyed by a card effect, so it cannot trigger, but it can pay off if this does somehow happen since Krawlers have a Foolish Burial, MST, ROTA, Warrior Returning Alive in their deck. With 2100 defense, your opponent might have to use a card effect to get rid of it, but at the same time getting a 2100+ ATK monster out in 2017/2018 isn’t really hard anymore. Each effect of Spine is a hard once per turn, but I don’t think this card or the Krawlers would of been too broken without it. The card is ok, thanks to support behind it, and it is a staple 3 of in the Krawler deck. Sadly, the Krawler deck as a whole isn’t really too good, but is part of the World Legacy lore just like the World Chalice monsters. Speaking of the World Legacy lore, we got a better archetype part of that lore in the next set, so if Krawlers don’t really satisfy you, the next one should as it is well designed. Krawler Spine is good enough support for a theme. 2100 defense is a nice stat to see in a low level Monster. But what can he do? The first effect is reminiscent of Man Eater Bug, a flip and destroy. The only downside really is that to get the latter effect where you get the two Monsters for free, is this card has to be destroyed while face-up. That’s possible with the high defense behind this card. I’m honestly not sure how good (or even not good) the Krawler Deck is, but it is well enough supported, and I’m sure will see more in the future.